UV curing conveyor systems offer consistent line speed, lamp height, and intensity together to provide a consistent UV curing process. UV curing conveyors eliminate stray UV light despite utilising some of the highest-intensity UV curing systems on the market. 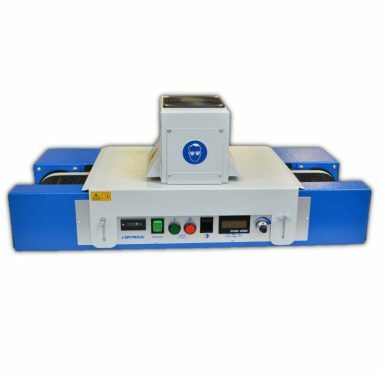 The Dymax UVC-5 UV Light Curing Conveyor System uses a high-intensity UV/visible light source for fast curing of adhesives, coatings and encapsulants. This cost-effective and versatile benchtop UV curing lamp is perfect for your lab or factory. It is a self-contained unit which fits on a bench and is powered from normal mains electricity.